The Best Mechanical Engineering blogs from thousands of top Mechanical Engineering blogs in our index using search and social metrics. Data will be refreshed once a week. Also check out Mechanical Engineering Youtube Channels. 2.7 CNCzone.com - The Largest Machinist Community on the net! Mechanical Engineering newsletter is a comprehensive summary of the day's most important blog posts and news articles from the best Mechanical Engineering websites on the web, and delivered to your email inbox each morning. To subscribe, simply provide us with your email address. About Blog Me Mechanical is an online portal for mechanical engineers on new innovations, inventions and technological advancements. Facebook fans 70,357. Twitter followers 471. About Blog The gathering place for mechanical engineers to discuss current technology, methods, jobs, and anything else related to mechanical engineering. Facebook fans 1,173,233. Twitter followers 532,649. Pune, India About Blog Mechanical Engineering World blog is all about Mechanical Basic Concepts, Mechanical Project and Seminar, Mechanical Amazing Facts, Engineering E-books ,New trends and Tech news. Facebook fans 10,778. Twitter followers 100. Ireland About Blog The Engineering Journal is a service whether , achievement, job oppurtinire. Facebook fans 7,952. Twitter followers 12,223. About Blog The Mechanical Design Forum is the No.1 global online community of mechanical design engineers. Facebook fans 11,584. Twitter followers 8,119. Facebook fans 4,739. Twitter followers n/a. 7. CNCzone.com - The Largest Machinist Community on the net! About Blog Worlds largest machinist, CNC , wood router, metal working , wood working , cad , lathe machine and manufacturing forum. Facebook fans 24,106. Twitter followers 1,479. About Blog This blog is for mechanical Engineering students by a student, Himesh Darji. The purpose of this blog is providing good and light information about mechanical Engineering. Simply providing most useful information search by the mechanical engineering students like Mechanical eBooks, PPT, Mechanical Aptitude Questions, etc. Facebook fans 17,986. Twitter followers 1,706. London, England About Blog Unique wooden mechanical construction kits made in Europe. Precise laser cut details ready for self-assembly without any special tools, glue and chemicals. Facebook fans 21,029. Twitter followers 1,969. San Diego, CA About Blog SolidProfessor provides online engineering courses for individuals, teams and schools. They deliver a world-class educational experience to engineers and designers who want to confidently and efficiently create innovative designs with CAD, CAM, and BIM software programs. Facebook fans 2,687. Twitter followers 1,453. About Blog AutoForm offers software solutions for the die-making and sheet metal forming industries along the entire process chain. With 300 employees dedicated to this field, AutoForm is recognized as the leading provider of software for product manufacturability, tool and material cost calculation, die face design and virtual process optimization. Facebook fans 14,328. Twitter followers 222. Burlington, MA About Blog Learn how to use multiphysics modeling and simulation to innovate and optimize your engineering designs. Get inspired by the COMSOL Blog today. Facebook fans 22,975. Twitter followers 4,220. Cambridge, MA, USA About Blog iMechanica is blog about mechanics and mechanicians. Hyderabad, India About Blog This is blog where all the fields of Mechanical Engineering are presented like Mechanical Projects,Mechanical softwares,Mechanical definitions,CATIA and ANSYS Tutorials,Mechanical Vibrations etc. Facebook fans 2,829. Twitter followers 29. New York, NY About Blog The New York Engineers' MEP Engineering blog provides best information and tips on MEP design, Energy saving, building codes, and new trends in the industry. Cut your construction engineering costs while simultaneously maximizing energy with our strategically efficient and functional MEP engineering designs. Facebook fans 133. Twitter followers 810. Ibi, España About Blog CLR High performance actioning solutions in compact dimensions for automotive, vending, electromechanics, security & HORECA . Facebook fans 204. Twitter followers 425. Hyderabad, India About Blog As an Engineer we apply science, Engineering concepts and mathematical methods to innovate things that never existed, design better machines, build Astonishing Constructions, develop procedures and systems, and maintain and operate the system and organizations. Our intention is to help the Engineers to understand such concepts, laws, procedures, definitions. Facebook fans 133. Twitter followers 5. India About Blog BIM is on its way up, and with software technology advancements in its court, it has trashed out all the redundant AEC industry practices to replace with the digitized workflows. Facebook fans 2,443. Twitter followers 997. India About Blog TrueCADD is your trusted CAD services company in India offering 2D AutoCAD Drafting, Engineering Drawings, 3D CAD Design and Modeling services at affordable cost. Facebook fans 2,427. Twitter followers 750. About Blog Mechanical manufacturing engineering focuses on the design, integration and operation of programs focused on the improvement of production efficacy. New York, NY About Blog Absolute Mechanical is on the forefront of heating technology, focusing on energy efficiency and green initiatives for your boiler installation. Facebook fans 42. Twitter followers 64. India About Blog Hi, welcome to ClubTechnical. This blog is here to tell the technical aspects of different things in short and precise way. Facebook fans 487. Twitter followers 59. About Blog Tips & Tricks from Mechanical Engineers with emphasis on simulation and related matters. Facebook fans 569. Twitter followers 434. London, UK About Blog Watch the latest technology in action, keep up with industry news and find career and learning advice right here on the IMechE YouTube channel. Facebook fans 482,539. Twitter followers 35,733. About Blog Mohammed Shakeel is a Mechanical Design Engineer from India who is popular for giving online lectures in Catia V5 and similar softwares. Canada About Blog Mechanical Business is dedicated to the ICI and residential market sectors in the plumbing, heating, air conditioning, ventilation, refrigeration and IAQ industry. Facebook fans n/a. Twitter followers 2,387. About Blog Read the latest from mechanical contracting blog featuring articles, tips, advice and updates from the pros at Yale Mechanical. About Blog Sharing best practice, lesson learned and career development in Oil and Gas Industry. India About Blog CAD Outsourcing Services, established in 1992, delivers comprehensive services for industrial engineering and AEC firms in more than 50 countries. Facebook fans 3,013. Twitter followers 546. Bentivoglio (BO), Italy About Blog SAMP Blog, the right place to learn more on wire and cable production, cutting tools, gears & machine tools. Our skills to color your mechanical engineering. Facebook fans 4,156. Twitter followers 673. About Blog Comprehensive up-to-date coverage for mechanical engineering, aggregated from news sources all over the world by Google News. Facebook fans 25,470,986. Twitter followers 214,189. 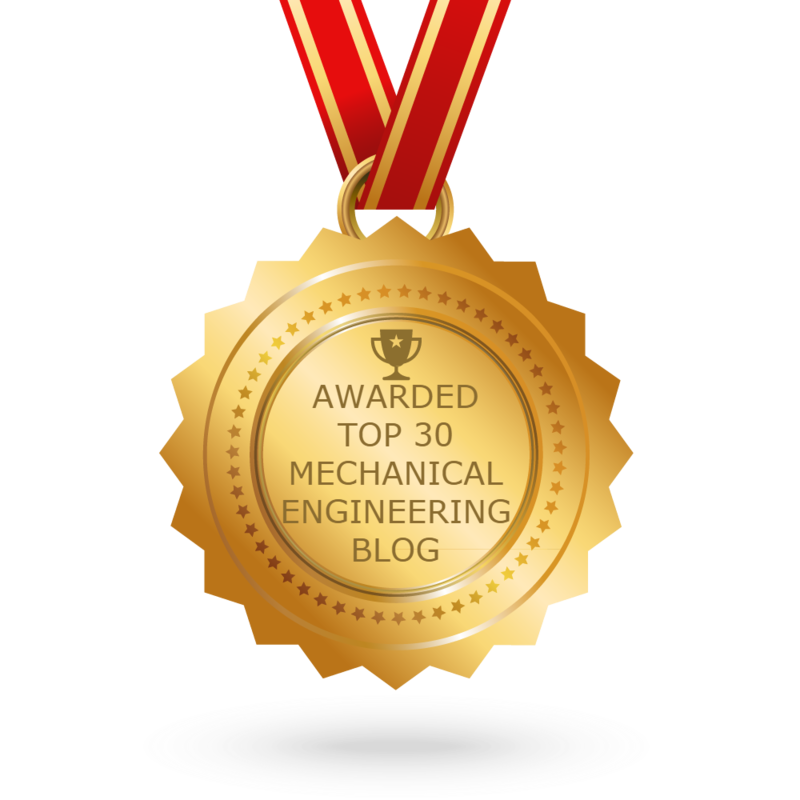 CONGRATULATIONS to every blogger that has made this Top Mechanical Engineering Blogs list! This is the most comprehensive list of best Mechanical Engineering blogs on the internet and I’m honoured to have you as part of this! I personally give you a high-five and want to thank you for your contribution to this world.